This is a collection of art highlights, viewed during my two trips to New York City. Though I didn’t get to all the galleries or exhibits I had hoped, I was overwhelmed by the wonderful art I was privileged to see. Interestingly, though I chose most of these works purely on how they struck me visually, I found a common string connecting many of the stories behind the art – travel! Most of these pieces were created in relation to the artists’ time spent living or vacationing somewhere foreign to their birthplace or home. It seems many of the artists featured in this post are expatriates and travelling creatives! Over the years that Monet painted his garden in Giverny, France, he focused more and more on the lily pond, gradually making the water’s surface the entire painting. Instead of painting the overall garden, he painted it as it was reflected in the water and explored the impact of different lighting conditions. In 1918, Monet painted Reflections of Clouds on the Water Lily Pond. The triptych of three canvases were part of a larger series of paintings intended to be placed around the perimeter of an oval room, in order to immerse the viewer. Eventually, some of Monet’s epic waterlily panels did make it into an oval room at the Musee de l’Orangerie in France. You can take a virtual tour on their website. Left: If it’s an impressionist artwork featuring ballerinas, it almost has to be Degas right? From the mid-1880’s Degas began to lose his eyesight and began to use more forgiving pastels and tactile sculpture to create his work. The vibrant pastels of Dancers in Green and Yellow, created in 1903, was what appealed to me over other Degas’ other works. This artwork hangs in the Solomon R. Guggenheim Museum, NYC. Below: Van Gogh wrote to his beloved brother Theo from France “This morning I saw the country from my window a long time before sunrise, with nothing but the morning star, which looked very big.” His vision of the dark French countryside was no doubt the inspiration for The Starry Night, at least in part. Van Gogh rendered his image in coarse brushstrokes, painting a quivering cypress under a swirling Milky Way and crescent moon. The village, partly invented, pays homage to his native Netherlands through the stylings of the church spire. Right: Postal worker Joseph Roulin was painted by his friend and neighbor in Arles, Vincent Van Gogh, on a number of occasions. Roulin’s wife and three children were also the subjects of Van Gogh portraits. This particular portrait of Roulin was painted after he left Arles for a better-paying job, therefore it is believed this was a painting from memory or referenced previous portraits. This piece is currently held by MoMA. Below: Henri Matisse’s The Moroccans, also exhibited by MoMA, was painted after two trips to North Africa. At first glance this piece seems almost entirely abstract, then you begin to see the man in a turban on the bottom right, melons on the ground to his left and a mosque beyond a terrace above the fruit. 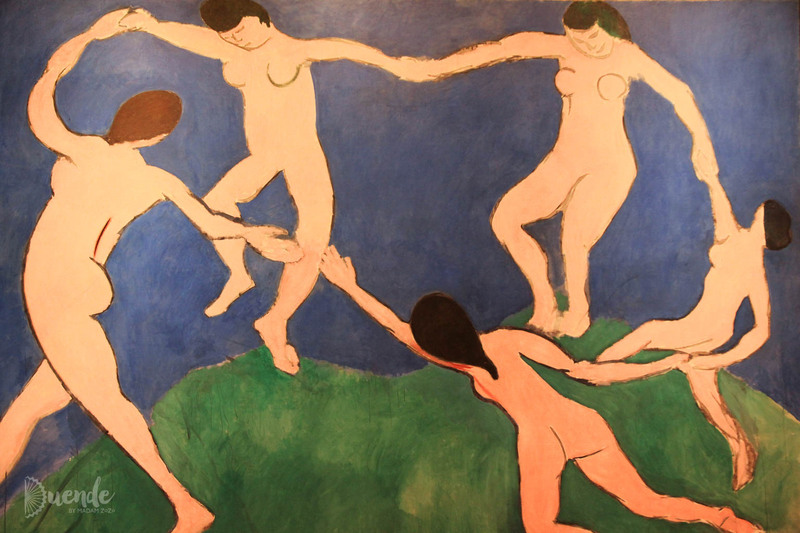 The Moroccans demonstrates Matisse’s interest in Cubism and friendly rivalry with Picasso. To me this piece wasn’t immediately recognizable as a Matisse, but drew me across the room as most of his artwork tends to do. Below: Summer, Dune in Zeeland was painted by Piet Mondrian in 1910 and is on display at the Solomon R. Guggenheim. Mondrian travelled annually to the town of Domburg, in the Dutch province of Zeeland, during the years immediately after he completed art school in Amsterdam. In his early career, Mondrian painted naturalistic landscapes and still-lifes like Dune in Zeeland before going on to found the De Stijl movement with which he is most often associated.Below: Henri Matisse’s The Moroccans, also exhibited by MoMA, was painted after two trips to North Africa. At first glance this piece seems almost entirely abstract, then you begin to see the man in a turban on the bottom right, melons on the ground to his left and a mosque beyond a terrace above the fruit. The Moroccans demonstrates Matisse’s interest in Cubism and friendly rivalry with Picasso. To me this piece wasn’t immediately recognisable as a Matisse, but drew me across the room as most of his artwork tends to do. Left: I and the Village is Marc Chagall’s depiction of his birthplace—Vitebsk, Russia. After studying in St Petersburg at the Zvantseva School of Drawing and Painting, Chagall moved to Paris in 1910. At the time Cubism was coming to the forefront of the Parisian art scene. I and the Village was painted shortly thereafter in 1911, showing signs of the Cubist and Fauvist influences he was absorbing. I and the Village is kept by MoMA. Below: Regent Street, London was commissioned by art dealer Ambroise vollard as part of a series that was intented to emulate earlier Monet paintings. André Derain travelled to London three times between March 1906 and February 1907 to make sketches, which were later translated into paintings back in Paris. This particular London scene depicts Regent Street near Oxford Circle. The painting is located in the The Met. Below: Polish immigrant to the United States, Morris Hirshfield, did not start making art until age sixty-five and was entirely self-taught! First, upon arriving in New York City at age 18, he cofounded a successful women’s coat company with his brother. It was only after retiring due to ill health that Hirshfield took up the brush. He passed away a mere nine years later, having produced seventy-seven artworks, and attracting the attention of the local and international art scene. 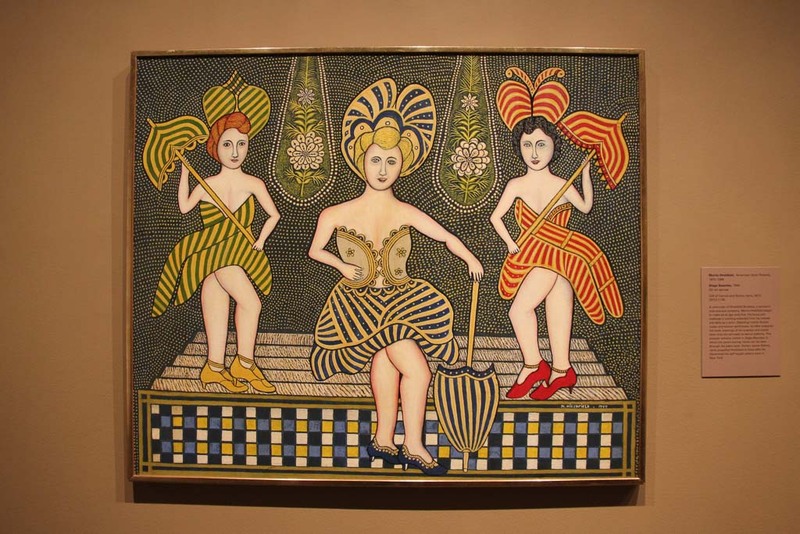 The Stage Beauties shows evidence of Hirshfield’s process, which involved full-scale sketches traced onto canvases. Stage Beauties can be found at The Met. Below left: Lisa Tréhot is the model in Woman with Parakeet, on display at the Guggenheim. Her painter and companion was Pierre-Auguste Renoir, who created this image of a black taffeta adorned bourgeois woman, seeming to confide in her pet parrot, her boredom with their opulent domestic surrounds. Above right: Described as, Broad Collar, this Egyptian piece dates between 1353-1336 BCE. The beads are made from fainence, tin-glazed pottery, and convey a stylised row of cornflowers around the center, followed by three rows of dates and finally an outer row of lotus petals. The two rectangular end pieces are decorated with blue lotus blossoms, buds and petals, with poppy petals and persea fruit (related to the avocado family). On display at The Met. Below left: The opalescent pink-hued Danish Palaces Egg, is a Faberge creation of 1890 St Petersburg, displayed at The Met. The egg was an Easter gift from Czar Alexander to wife Maria Feodorovna. The enamel egg opens to reveal a series of Danish and Russian landscape miniatures inside a length of folding gold frames. The egg accompanied Maria on her travels as a reminder of home. The Faberge work master was Mikhail Evlampievich Perkhin and artist of the miniatures was Konstantin Yakovlevich Krijitski. Above right: Frantisek Kupka created Mme Kupka dans les Verticals from an unfinished portrait of his wife, layering over it verticals of colour. It was the colour palette of this piece that most attracted me. Left: I caught this piece in MoMA not long having finished reading a Frida Kahlo biography. It was exciting to see her work for the first time in person. Fulang-Chang and I along with much of Kahlo’s work, has been referred to as Surrealist in style, though Kahlo rejected the idea that her painting were surreal, but instead maintained they were an expression of her reality. Fulang-Chang was one of her monkey pets, and she later had their dual portrait attached to a mirror before gifting it to a close friend. The mirror was intended to bring her friend into the painting so they could be together—a beautiful sentiment. See more art highlights of New York City, of the street art variety in Art on the Street – New York City.